The Broke and the Bookish : Jen Reviews "A Long Way Gone"
Summary: At the age of twelve, Ishmael Beah fled attacking revels in Sierra Leone and wandered a land rendered unrecognizable by violence. By thirteen, he'd been picked up by the government army, and Beah, at heart a gentle boy, found that he was capable of truly terrible acts. At sixteen, he was removed from fighting by UNICEF, and through the help of the staff at his rehabilitation center, he learned how to forgive himself, to regain his humanity, and, finally to heal (from back cover). Honestly, I don't even know how to begin this review. This was such a depressing but educational (for me at least) memoir. 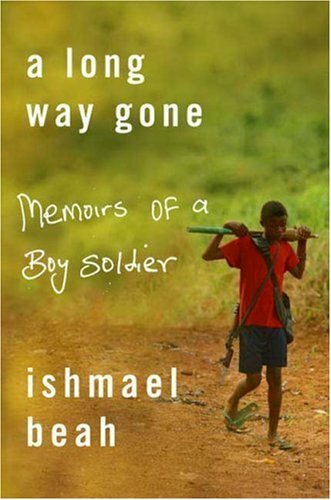 A Long Way Gone is a horrifying account of the life of one child solider, Ishmael Beah. We've all heard of child soldiers but I guess I never really thought about how horrible it was. You know when you hear about something but it's hard for you to put it into perspective? Well this book was quite the wake up call. Ishmael was a happy-go-lucky kid. He had heard of the war in his country but never thought it would ever come close to his village, let alone destroy it. He was separated from his parents and had to flee his village with a few friends. The four boys walked for a couple days until they arrived at the village of Ishmael's grandmother. Sadly, her village had been taken over as well. They couldn't stay there so they kept walking just looking for a safe place. Ismael and his friends ended up wandering around Sierra Leone for several months (I think it was close to a year, but I'm not exactly sure). I can't even imagine this. Being twelve-years old and you're on your own with a few other friends. Wandering around the country trying not to get kidnapped or killed and having to steal food or starve. It's heartbreaking. Ishmael, like many of the other children, was manipulated into becoming a soldier. They came across a village they thought was safe, and at first it was. Slowly he was given small tasks to do (helping prepare dinner for the village, working in the fields, walking around the perimeter of the village). All leading up to one day when they handed him and the other children their own guns with bullets. This is a depressing and gruesome book. If you want to know more about the life of child soldiers I would recommend reading this. There were a few times when I had to put the book down because of some grotesque or depressing details, especially because you remember that children committed these horrible acts of violence. When I first finished reading A Long Way Gone I wasn't even going to review it. I knew because of the subject matter it would be too difficult to put my thoughts into a nicely flowing review. But I also want more people to be aware of this book. Thanks for the review! I almost picked this up a few years ago for a project I was doing, but hadn't heard anything about it. Now, I may just have to add it to my tbr pile, it sounds like an amazing read. I've been meaning to read this one FOR-EV-ER and it's sitting on my TBR shelf waiting for me, but I know I've avoided it because of the difficult subject matter. Thanks for the review though as it does sound like it will be an educational and informative book... if I can gather enough courage to actually pick it up! This has been on my TBR list for a long time. I really need to read it. Thanks so much for the review! That does sound like an educational, yet horrifying memoir. But I do read to expand my view of the world, and what better way than through memoirs. Sounds like a fascinating book. I found that we, in the US, are very sheltered from the outside world. We don't realize that many people of the world gets up in the morning not knowing if they'll eat that day. I thought this was a very powerful and interesting book! I read it quickly and in my head kept thinking I would never make it if it had been me. My daughter is 10 years old. I just cannot imagine her going through one tiny iota of what he did! This book was so difficult to read, but also so worth it. I understand why you had difficulty reviewing A Long Way Gone. I read it before I began blogging but I'm not sure I could adequately sum up this book in a review, had I read it more recently. This has been on my TBR list since like 2008 or so!! I really love reading things like this, despite how hard it is sometimes, to stay grounded and thankful! These are some of the hardest, but sometimes really amazing, books to read and talk about. Thanks for posting. I've been hearing a lot about this book lately, & it sounds gut-wrenching. It's been on my tbr, but I think I'm going to have to mentally & emotionally prepare myself before starting. Thanks for the review. Reading memoirs is a personal goal of mine and this one is on the list for sure. Sounds like a dynamic read. This book is definitely an eye-opener. It's a tough subject matter but its totally worth the read. I appreciate my childhood SO much now. I absolutely love this review. I've almost bought this book several times. Nothing stopping me now! Thanks Jen! This is one of the most heartbreaking books I'd ever read. Definitely don't regret reading it. We have it so good. Miss Lauren: It makes me so happy that you're going to read this book now! Let me know what you think of it! christa: I completely agree with you! I knew it was going to be a sad book but I didn't realize how depressing it was going to be! But I'm so glad I read it. One of my friends picked this for our book club on her turn. It was intense. Very sad. The fact that you keep reminding yourself "this really happened" through out the whole book makes it all the more so. I read this a few years ago, it was a random pick at a secondhand bookshop and rather than let it sit around on my bookcase for months I felt compelled to read it right away - and I was so glad I did. I certainly have never forgotten it since, it really sticks in your head and gives you a bitter insight into the lives of child soldiers. It got me interested in other stories like it, like War Child, but I haven't read that one yet.